I sip my first mug of morning coffee while gazing at a cow elk standing on the other side of my frosted living room window. She stretches her neck toward the prickly limbs of an Engelmann spruce and rises, briefly, on her haunches to reach the lowest branch. She hangs there just long enough to tear off a mouthful of needles before lowering herself to the ground. Yesterday I saw a different cow elk snap a twig from the winter skeleton of a wild rose bush. And every day for nearly a month I’ve watched a herd of bison swing their broad heads through the deep snow to gnaw on the matted grass that rests beneath. It’s winter in Yellowstone, and the animals are getting desperate. This morning is particularly wintery. It’s frigid, really. The thermometer reads twenty degrees below zero. John asks if we need to leave the house so early. I grumble something about how the survey is supposed to start at 8am. It’s 8:30. I take another sip of coffee and settle into the couch, pulling a wool blanket over my lap. But an hour later I am dressed in full down, wool hat, gloves, and winter boots. I string a pair of binoculars over my layers and fill two thermoses with coffee and a splash of homemade Irish cream. The shock of frozen air as we open the door prods us to grab one more warm thing before heading outside. It’s the mid-winter eagle survey — a one-day count of all the bald and golden eagles we can find. We hope to find many. Our route includes the five-mile stretch of road between Mammoth, which lies inside Yellowstone, and the town of Gardiner, which abuts the park boundary. We’ll then climb the road toward Jardine to survey Bear Creek and a few side roads in the Gallatin National Forest. Finally, we’ll travel north along a portion of the Yellowstone River to a place called Point of Rocks. We’ll search the entire area, but we know where all the eagles will be. The road to Gardiner begins high but drops swiftly to meet the river which ushers us toward the park boundary. You’d never know you had crossed Yellowstone’s boundary if it weren’t for the small brown kiosk at the entrance and, of course, the famous Roosevelt Arch. There is little to signal the transition from park to town, from town to national forest, and from national forest to park. The wildlife can’t tell either, although they know well enough during hunting season. Yellowstone’s boundary was drawn in a rough rectangle with a ragged edge here and there. The park spans an area of 2.2 million acres and is bordered by four national forests. 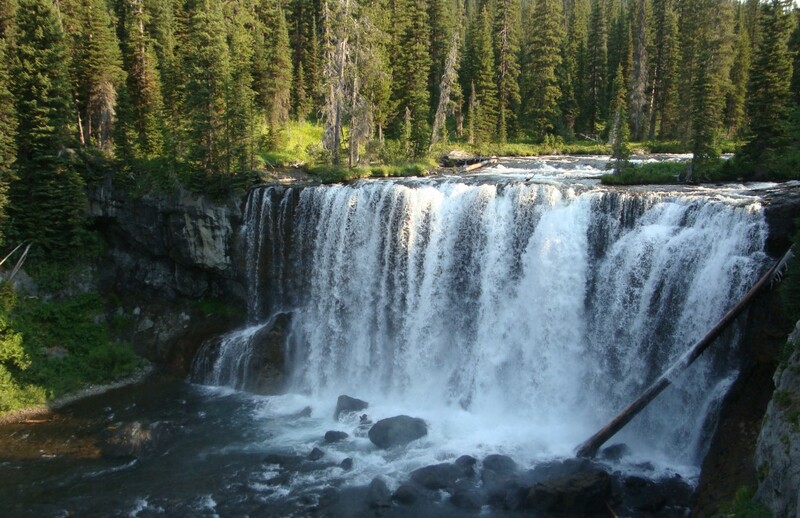 Yellowstone and the surrounding region is said to be the wildest in the coterminous U.S. It would seem, then, that this vast container of wilderness would be enough for the wildlife within, but Yellowstone’s boundaries were not drawn with wildlife in mind. By the time we enter Gardiner, we haven’t seen a single eagle. Town is quiet this morning. I imagine everyone sipping coffee by their wood burning stoves, peering out at the frozen world. We perk up as we make the turn toward Jardine. The bison hunt is well underway and the hunters have been successful this year. The deep snow in Yellowstone has forced hundreds of bison to lower elevations outside the park. They have only to put a hoof over the line before they become game animals. It’s a choice between starvation and staring down the wrong end of a rifle. This is where the eagles will be. At the park border, feasting on the remains of bison. We scan the snow for splashes of red. We examine rocks for perched birds. We watch ravens and magpies, hoping that they will lead us to a carcass, but they don’t. The rocks are just rocks and the snow is unmarred. I wonder whether they have found a carcass and are anchored to the ground by a crop full of meat just over the rise of a hill and out of our view. The road winds high above Bear Creek with views into the park. We nearly reach the end of our route when John spots a raptor perched among the twisted limbs of a snag. It’s a golden eagle with its back turned to us. While watching the golden eagle, we hear the call of a bald eagle above Bear Creek. We know it’s not talking to itself so John looks for a second bird. He spots an adult bald eagle in a snag, then another, and then two more in the same tree. I pull away from the golden to scan the trees and everywhere there are bald eagles. We count fifteen bald eagles altogether, sixteen including the golden. Most of them are adults and all are perched contentedly in the trees. I don’t know where they have all come from, but I do know that at least some of them breed in the park. Others probably flew from up the valley, and others still may have migrated from Canada or even Alaska. It takes a large area to grow an eagle. It takes a large area to grow a bison and an elk. It takes Yellowstone and then some to sustain the grizzly bear and the mountain lion. It is not even enough for a yellow warbler, which weighs only a few grams. Most national parks and wilderness areas, those places set aside for wild nature, were the lands no one else wanted. They are not good for farming or ranching. They are mostly located in high elevation areas with extreme climates and brief growing seasons. Humans have claimed the richest habitat for themselves, like the dark rich soils of valley bottoms and floodplains where spring comes earlier and winter a bit later. If it were up to me, I would create more public lands. I’d snap up what private land is left and do nothing with it, except tear down fences and manage for blurry boundaries. Nothing in nature is as hard edged as the boundaries humans create. On our way back from the eagle survey we are stopped by a ribbon of a dozen bison cows and calves walking down the road. They are heading north toward the park boundary. The sun has nearly set and in an instant it vanishes behind the mountains, and all I hear is the sound of their hooves clapping the ice in the darkness. Their movements are slow but full of purpose. Thank you, Marcia. You should come visit one winter just to see for yourself. Although, depending on how early you arrive this year, you may find a snow-covered landscape. Wonderful! How many eagles were counted? I’m not sure how many were counted altogether, but usually there are half as many as we counted in the entire park. Really nicely done, Lisa. Thanks for sharing your writing with us. Thanks, Mary. I’m glad you enjoyed it. Thanks, Julianne. And thank you for providing a way to oppose these ridiculous bills. Lisa…ditto what Julianne said! You put me there in the cold with you, watching eagles. A subtle, but strong, maybe only marginally intended? plea for public lands. Whatever happened to Y to Y? Anyway, thank you for a peaceful start to my day. You are right, Neysa. This was a subtle plea for public lands. I’m glad you enjoyed it.